As huge fans of the original Jumanji and its source material, we were initially hesitant when we heard there was going to be a new Jumanji film. However, after seeing trailers for Jumanji: Welcome to the Jungle, we actually got pretty excited. So much so, that we have created a new recipe for its release, Jumanji Jungle Cake! In Jumanji: Welcome to the Jungle, Kevin Hart portrays the avatar Franklin “Moose” Finnbar. This character’s number one weakness is cake. Who doesn’t love cake? The trailer also prominently features pound cake, so we decided to use that as our base. 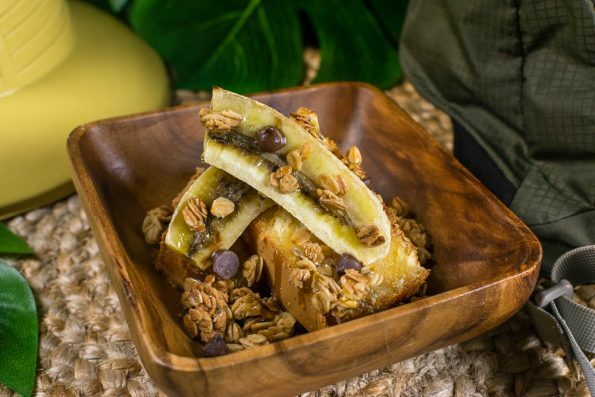 Additionally, we used other jungle/outdoorsy foods like bananas and granola. The result is a delicious cake with good flavors and textures! It is also customizeablein that you can definitely switch out the flavors of granola or substitute it for nuts. After trying our Jumanji Jungle Cake, we’re sure you’re going to have a weakness for cake like Kevin Hart’s character! Now for the part you’ve been waiting for! We are giving away three pairs of screening passes for an advanced showing of Jumanji: Welcome to the Jungle! The showing will be held at Harkins Scottsdale 101 on Monday, December 18th. The screening starts at 7 pm and the winners should arrive at 6:15 in order to guarantee their seating. Winners will be selected on Sunday, December 17th. Good luck! Peel bananas, cut into quarters, and place on foil lined baking sheet. Remove from oven and allow to slightly cool. Cut pound cake into slice around half an inch thick. In each bowl arrange 2 slices of pound cake. Top with banana quarters and granola. This would be a cute dessert to have the night we go see the new Jumanji movie coming out this year. Saving to surprise the kids with it! This looks like a totally fun cake. I think it would make a great brunch item as well as dessert. Cute idea, I was the same, a little hesitant when i saw they were remaking but it looks like it might be a great movie! I was actually afraid of the original Jumanji as a kid because of the giant spiders, and I don’t think I have watched it since. The cake looks delicious though! Your jumanji cakes sounds like so much fun and it’s definitely a dessert the whole family would enjoy. Oh wow. What a great idea! I just saw the previews for Jumanji yesterday. I can’t wait to watch the movie. Your recipe sounds super easy and delicious! I loved how you made it look outdoorsy. This is so creative! I can’t wait to see the movie. If I had kids, this would be the perfect thing to make before/after seeing it. I greatly enjoyed Jumanji when I was younger. I’m still a little hesitant about the new one but will for sure be seeing it -probably not in theaters though. My husband is a huge fan of The Rock, so there’s that too. Haha. This Jumanji cake likes like a nice little treat! OMG YUM! Such a creative recipe idea!! This is awesome! I love Jumanji! 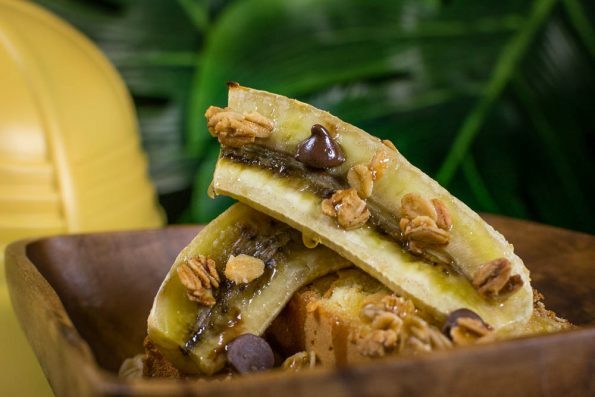 My kids can’t wait to see this movie – they will love the jungle inspired cake! What a great idea for getting the kids excited to see the new Jumanji movie! My kids are waiting to watch the movie. The cake looks delicious and super easy to make . Love this idea, easy and delicious with different textures. Great! OK, I must admit… (read this in 8 point) I’ve never seen Jumanji. I know, I know… where have I been. Guess I better get on it… and make this cake while I’m at it. It looks delicious!